Euroma2 , the EUR Concept Mall, which has always been committed to offering events dedicated to culture, has started an important collaboration with the “Museum of Civilizations” of Eur MuCiv . 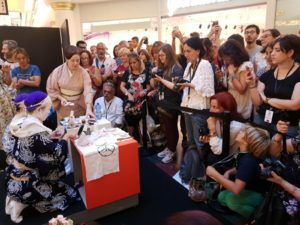 The innovative agreement was inaugurated on August 3rd with the opening of an exhibition path inside the mall, parallel to the current exhibition at the Pigorini Museum, entitled ” Geisha – art and the person ” curated by Loretta Paderni, which will remain open until October 30, 2018 . To embellish the path, a double appointment has been planned for all lovers of Japanese culture: Sunday 9 September a joint workshop was held between the Museum of Civilizations and Euroma2 , entitled: ” A Day in a Geisha House ” . At the “L. Pigorini “, in the Sala delle Conferenze, the program included a story illustrated by the protagonists,” Vita da Geisha “. After a short lunch break the workshop continued with ” Geisha School “, a series of demonstrations and traditional dance and music lessons. At Euroma2in the afternoon, a demonstration of the traditional kimono (kitsuke) and makeup (oshiroi make up) was organized, to discover the magic and secrets of make up and typical Geisha hairstyles. Afterwards, the audience that gathered for the occasion took part asking for souvenir photos with the Geisha. The workshop at Euroma2 , open to all, was one of the events in the traveling Festival #AGeishaDay (September 6-16, 2018 in Rome). The project of the exhibition “Geisha – art and the person” was born from the common intention of making the art usable by integrating it into the spaces of everyday life as a stimulus and entertainment for the general public. This in-depth study of the important exhibition dedicated to the figure of the geisha through time, offers a double iconographic journey within Euroma2 , a traditional one and an updated one. 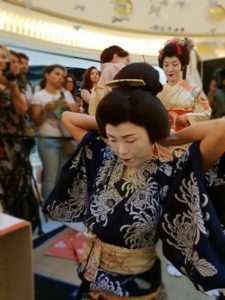 At the main entrance of the Concept Mall you can admire the image of a geisha reproduced on a large scale that opens the retrospective on ancient iconography. Nineteen suspended panels selected from the volumes of the series ” Ehon Seirō Bijin Awase”, a work of 1770 on the courtesans of the Verdi Houses, by Suzuki Harunobu, will accompany the public on an immersive walk to discover the activities of the geisha in the private apartments of the Edo period. The exhibition portrays the elegance, sensuality and grace achieved by the young geisha, highlighting the wide and careful discipline that combines the care of aesthetics to the study of classics and arts, such as traditional dance (nihonbuyō), singing, acting, music, calligraphy (shodō), the art of arranging flowers (ikebana) and tea ceremony. The section dedicated to the contemporary world is developed in the galleries on the ground floor of Euroma2 and is narrated by the evocative photographs of Fabrizio and Federico Bonifazi , which reveal how the figure of the geisha, cultured and refined entertainment artist, has changed over the years and has adapted to the contemporary world, while remaining linked to the rules of the past. The district of Gion, in Kyoto, where even today you can breathe the atmosphere of ancient times, is the protagonist of the shots. Thanks to the collaboration of Euroma2 with the Museum of Civilizations , those interested in visiting the exhibition ” Geisha – art and the person “, at the “Pigorini” Ethnographic Prehistoric Museum in Piazza Guglielmo Marconi 14 in Rome, open until 30 October, they will receive a 50% discount on the ticket price, presenting the Euroma2 Gift Card or APP at the Museum ticket office. In addition to numerous photographs, in the Museum you can admire precious objects of Japanese art, kimonos, fans and musical instruments, for the first time presented to the Roman public.